With the planet’s human population projected to reach 9 billion by 2050, the demand for arable land to produce food, fuel and fiber is on the rise. Many look to Africa to meet this demand, viewing the continent as replete with vast expanses of unused land. However, much of this unexploited land provides valuable ecosystem services. Forests, for example, help minimize soil erosion and reduce the risks of water scarcity and floods. Farming requires healthy soil and an adequate supply of clean water, meaning that farmers and everyone else along the agricultural value chain—from seed and equipment vendors to food processors to truck drivers— ultimately depend on forests and other ecosystems for their livelihoods. Recognizing the relationship between ecological systems and agricultural success, African Wildlife Foundation (AWF) is showing how agriculture development can support conservation in an area slated for large-scale agricultural expansion, Southern Tanzania. The Southern Agriculture Growth Corridor of Tanzania is a major development initiative aimed to engage tens of thousands of smallholder farmers in irrigated commercial agriculture to provide more than 420,000 new farming, processing and transportation jobs. The target geography of the corridor runs through three landscapes of conservation importance, known for their sizeable elephant populations. Through IUCN’s Sustainability and Inclusion Strategy for Growth Corridors in Africa (or SUSTAIN) program, and with support from the Netherlands Ministry of Foreign Affairs, the Global Nature Fund, the German Federal Ministry for the Environment, Nature Conservation, Building and Nuclear Safety, and the International Climate Initiative, AWF takes a partnership approach to delivering conservation outcomes in the Kilombero Valley. With the business acumen of Kilombero Valley Teak Company (KVTC), the public policy reach of Belgium Technical Cooperation and the conservation knowledge of AWF, the program has invested in a forestry enterprise that enables communities to benefit from forest conservation and generate revenues at the same time. This month, AWF conducted a workshop to review, discuss and establish a way forward toward improving Tanzania’s forest policy by incorporating public-private partnerships in natural resources management and governance. Using KVTC’s primary woodland as a case study, the project continues to explore how forests under private ownership can be jointly managed with communities. Ultimately, forests can be turned into a sustainable business that benefits all stakeholders with no expenses to the environment. 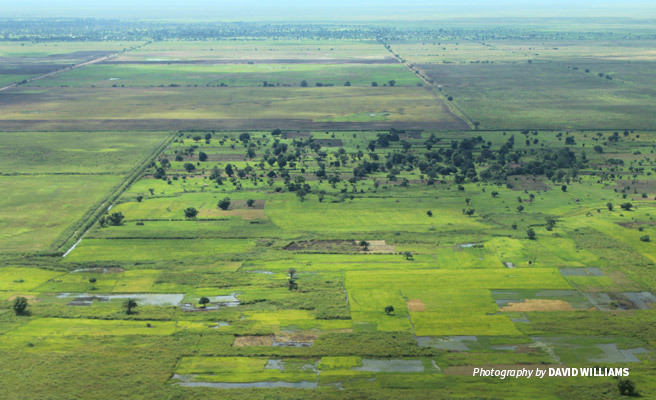 Another partnership between AWF, Tanzania Forest Conservation Group and Kilombero Plantation Limited, a leading rice producer in Tanzania, has established a system for payment for ecosystem services to support watershed conservation in the Mngeta sub-catchment. Kilombero Plantation Limited, which requires a healthy watershed ecosystem for rice farming, pays four communities upstream from its plantations for their participation in restoring the degraded catchment. These market-based partnerships for land, water and ecosystem conservation have invested $1,000,000 in 40,286 hectares of land under sustainable management and target a total of 33,448 beneficiaries. Equally as important, these partnerships aim to prove that conservation-friendly agriculture can extend beyond niche products for which consumers willingly pay higher prices. For major commodity crops like rice or forestry products like teak, companies cannot pass along any additional costs for sustainable practices to their consumers. Yet ensuring conservation success hinges on scaling up conservation-friendly agriculture practices to include commodity crop producers who are dominant decision makers over land and resource allocations in landscapes across Africa. Companies participating in the SUSTAIN program acknowledge the imperative for protecting ecosystems that underpin agricultural production. Through SUSTAIN, AWF helps corporations collaborate with communities and technical experts to embed conservation into their products’ value chains—a crucial investment in their own long-term success. By creating public-private partnerships that support land conservation and livelihood improvement, AWF is providing a model for delivering inclusive, green growth throughout the Southern Agricultural Growth Corridor of Tanzania. Andrea Athanas is a Program Design Manager with the African Wildlife Foundation. She has experience building business practices for biodiversity conservation and advising companies such as Shell, Nestle Nespresso, and Rio Tinto on managing their environmental footprints. Her current portfolio focuses on bringing wildlife conservation into the transformation of African economies focusing on agriculture and energy and building partnerships in Europe for AWF.